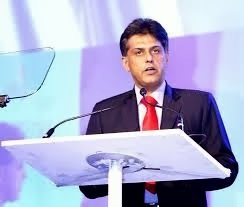 The aspirations of Diaspora youth and resident Indians were articulated here on the opening day of Pravasi Bharatiya Divas (PBD) with Shri Manish Tewari, Minister for Information and Broadcasting, stating that while border control. Visa regulations and immigration formalities were the ground realities in connecting the global youth, it was undeniable that the march of technology, through the use of the internet, has enabled them to become a part of the global conversation. Speaking at the Plenary Session of Youth PBD, Shri Tewari said that the internet represented the largest ungoverned space on earth and every two days more data is produced than since the dawn of civilization to the year 2000. This technology has given rise to a virtual civilization that allows young people who have the desire and passion to connect with others with similar aspirations around the world. The Minister said that during his overseas travel in recent months he has discovered that the younger generation has a common aspiration: to make a life for themselves and make the world a better place to live in. In this context, Shri Tewari suggested that PBD should evolve a non-formal connect in an unstructured manner to allow the youth across the world to connect with one another seamlessly. The session provided insights into India’s fast emergence as a youthful and exuberant nation where approximately 50% of the working population falls in the age group of 18- 35 years. There has been some reverse migration in which a number of experienced and educated NRIs are now returning home to use their knowledge to build an inclusive and economically sound future for the country. This has led to the creation of a unique synergy wherein young Indians worldwide are now set to shape the future of the Indian growth story. This synergy is expected to be directed by the core principle of inclusive prosperity and driven by innovation and technology.